A fugitive crew of a U.S. nuclear submarine seeks to uncover the truth behind suspicious orders in the recently-cancelled action-thriller TV show Last Resort: The Complete Series. 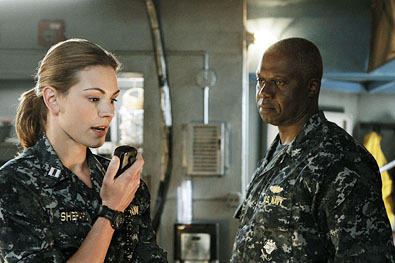 Daisy Betts follows through on Andre Braugher's orders in Last Resort. The U.S. ballistic submarine Colorado sits 500 feet below the Indian Ocean when orders come in to fire nuclear missiles at Pakistan. Captain Marcus Chaplin (Andre Braugher, TV’s Men of a Certain Age) and XO Sam Kendal (Scott Speedman, The Vow), both question the legitimacy of the order and ask for confirmation, but instead receive missile fire from another U.S. submarine. Left for dead at the bottom of the ocean, the Colorado finds refuge on an exotic island. As troops come toward the island, the members of the crew must work to clear their name and find out who is involved in a conspiracy of nuclear proportions. Created by Karl Gajdusek (Oblivion) and Shawn Ryan (TV’s The Shield), the series also features Daisy Betts (Shutter), Camille de Pazzis (Gamer), Autumn Reeser (The Big Bang), Jessy Schram (Unstoppable) and Robert Patrick (Gangster Squad). Though the critics were generally positive in their assessment of Last Resort and early on, it had all the makings of a hit, Last Resort was cancelled in the middle of its first season. The makers needn’t worry about a bomb going off in their show—the very program itself detonated.. The DVD contains the following bonus feauturettes—13 of’em!! Almost seems like the producers thought the series was going to run a loooong time…. Making the Pilot – Taking viewers behind the scenes for a look at the making of the pilot episode. · Profiles in Courage – Co-creators and executive producers Shawn Ryan and Karl Gajdusek explore the dossiers of the USS Colorado crew members. · Conn Artists — Production Designer Jim Spencer and Set Decorator Brenda Meyers-Ballard reveal the secrets of the nerve center of the USS Colorado. · Grace Under Fire — Daisy Betts reflects on the obstacles Grace Shepard confronts in “Skeleton Crew” and how the lieutenant’s role is evolving. · Ties That Bind – Will Christine defend Sam to the end? The stars discuss the strain on this crucial relationship and how Sophie and Paul are complicating matters. · Subvirtual — A look at how the Fuse FX team created the show’s stunning computer-generated visual effects. · Turning Point – Shawn Ryan and Karl Gajdusek recap the Naval SEAL mission in Pakistan that sets off the chain of events in the series. · The Mole – Jessica Camacho peels away the layers around Cortez’s undercover role aboard the USS Colorado. · Serrat’s Lair – A look inside the ornate and elaborate estate that serves as Serrat’s island compound. · I, Kylie – As troubles at home come to a head, Autumn Reeser recounts the motives and evolution of the outspoken Kylie Sinclair. · Epilogue – Cast and crew recount the harrowing events in “Controlled Flight Into Terrain” and speculate on where the characters would go from here.